Books, websites, and more from Hilbert College's Campus Ministry. Hilbert College is an independent institution of higher learning that embraces its Catholic Franciscan heritage and values. Students from diverse backgrounds are educated in liberal arts and professional programs to become informed citizens committed to serving and strengthening their communities. 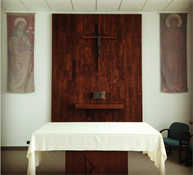 Hilbert Campus Ministry serves the religious and spiritual needs of the students, faculty and staff by offering worship, fellowship, outreach, and educational opportunities. Campus ministry also seeks to help students integrate their faith and learning, thereby fostering Franciscan values as well as the development of individuals into leaders in their local, global, and faith communities. The Offices of Campus Ministry is located in Bogel Hall. Students and staff are welcome to stop by for either an informal visit or a scheduled appointment. Whether you are of a different faith, or no faith, all are welcome!